I can still remember the beautiful June day when I first fell in love with Deer Isle. Driving over the bridge was slightly terrifying, but in the ensuing years I have come to appreciate the work of art that it is. Some people say they have a love-hate relationship with the bridge; mine is a love-love relationship. I love it in all kinds of weather, night and day, rain or shine. I marvel at its structure, and the way it makes noises in the wind. I love approaching it on a foggy night; suddenly, it appears out of the fog, and I feel a twinge of fear as I think “I wonder if it’s all there.” Then, as I drive on, more and more of the structure emerges from the fog, and before I know it I’m on the other side and speeding towards home. Most of all, though, I love its height and length – the very real (and yet symbolic) connection between our island and the mainland. information on things to do and see. When you leave the information center, take a right and head down to the end of Little Deer Isle to the Eggemoggin Colony, and a great view of Pumpkin Island Lighthouse. About 1.7 miles from the information center you will see Alfred’s Roost on your left. Stop in and meet Alfred who should brighten your day and where the unique is commonplace. Owner Dusty Eagan has created a fun and welcoming studio space. Make sure to watch for the sign for Wilson Studios on your right as you drive; Doug Wilson does beautiful functional and architectural iron work. After that little side trip, head south again on Route 15 towards the village, located about mid-island. As you cross the causeway and head uphill; at the top of the hill, take a left onto Old Ferry Road to visit the Ronald Hayes Pearson Design Studio – featuring his gorgeous designs in gold and silver. Rumor at press time was that there might be some exciting changes afoot here. Returning to Route 15, the next diversion takes you left at the Reach Road. About 2/10 of a mile on your right you’ll see Greene-Ziner Gallery. Melissa Greene makes exquisite earthenware pots and Eric Ziner creates sculptural metalwork. They tell us their organic farmstand has the same open hours as their gallery this year, offering produce, eggs, goat cheese and yogurt, and so much more. Continue on Reach Road for about four miles to visit Rumplestiltskin Handspun Fibers – for gorgeous handspun, dyed and naturally-colored yarns by Pauline Boyce. Returning again to Rte. 15, and just before you get to Deer Isle village (about 5 miles from the bridge), watch for Susan Hutton’s sign on the left. Susan makes really fabulous jewelry – affordable and appealing to many tastes. Her gallery also houses work by a number of other fine artists – including paintings, ceramics, wood, and photography. Next, you’ll see Frederica Marshall’s studio sign on your left. She exhibits her watercolors and Asian brush paintings, offers classes for kids and adults. Her husband, Herman Kidder, operates Kidder Forge here, creating jewelry and small forged items. Just beyond, you’ll find Turtle Gallery on your left. Owner Elena Kubler’s eye for fine art and contemporary craft is reflected in her rotating shows. Be sure to visit the sculpture garden. 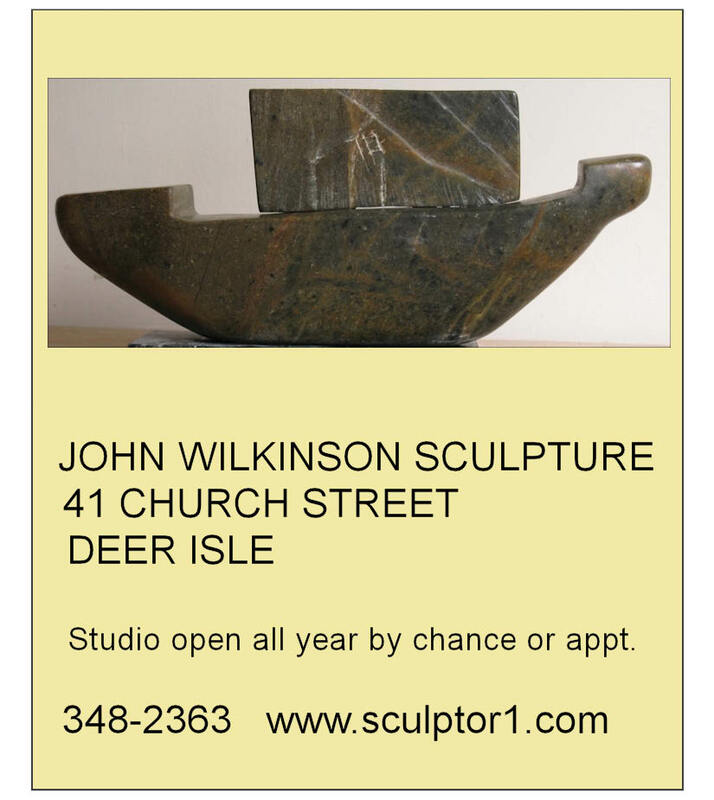 This summer, Turtle Gallery will be exhibiting works by the late Deer Isle folk sculptor, George Hardy. 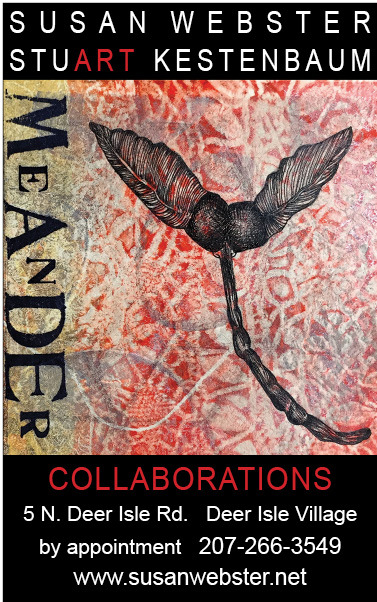 Take a right turn onto Dow Road and stop at Pearson Legacy Gallery – Carolyn Hecker’s gallery offers rotating shows and the gorgeous jewelry of Ronald Hayes Pearson all in one stop. top in next door at Dowstudio Galle to see ceramics and fabulous jewelry by co-owners Carole Ann Fer and Ellen Wieske. They also feature the work of dozens of fine craftspeople from around the US, as well as the artists of Spindleworks, an art center for adults with disabilities in Brunswick, Main. s you go down the road to the village, Susan Webster’s Studio (in the big yellow house on your left) is open by appointment only this summer. In the center of Main Street, Fibula features beautiful jewelry by owner Laura Giverts and others, as well as photography. As an added bonus, you can stop in here for a great espresso, cappuccino, or latté and light pastry! Be sure to stop in at Deer Isle Artists Association’s Gallery in the building next to the library. DIAA member artists display their work in rotating shows throughout the summer. The Periwinkle, across from Harbor Ice Cream – a favorite stop for generations of children and adults alike – is open seven days a week, offering select Maine made gifts and more. Continuing through the village on Bridge Street (Rte 15A), turn right onto Pressey Village Road. On the right, after the turn, Carol Wainright’s River Horse Rugs studio is open by appointment. A little further, on the left, you will find Bunzy Sherman’s barn gallery showing her own wheel-thrown, functional pottery, as well as the imaginative work of her late husband, Irving Read our feature on Bunzy. If you stay on Rte. 15A towards Stonington, you will come to Kingman Photography Gallery on your left at the corner of Center District Cross Road. 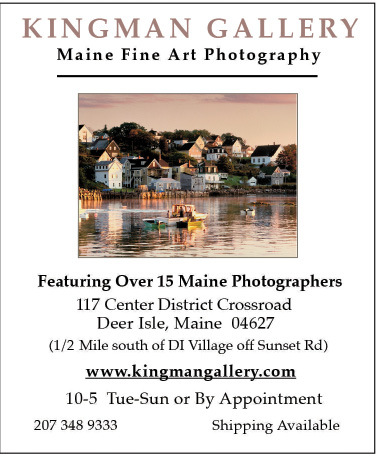 Stop in and see some the work of over 15 Maine photographers, curated by gallery owner Anne Page. Keep going along Rte 15A to Wildflower Gallery – on the left just beyond the Deer Isle-Stonington Historical Society – where you can see paintings by Dave Taylor and pottery by his wife, Tanya. And while you are in the neighborhood, check out the Salome Sellers House (home to the historical society, and a fascinating step back in time), and pop into the Island Heritage Trust office for information on trails, island land preservation, and unique gifts. But wait! Let’s not get away from the village too far just yet – you’ll want to check out the B. W. Bulger Gallery and Atelier, on the first floor of the Seamark Building on Church Street (Rte. 15). Also, on the second floor of the Seamark Building, Holley Mead’s Deer Isle Designs offers interior design services. While you are right there, poke your head in at 44 North Coffee – on the second floor – for hot or iced coffee, cool coffee gear, or freshly roasted beans to take home. See our article about 44 North's exciting new location on Stonington's Main Street in the Stonington Section. Don’t miss a trip to Haystack Mountain School of Crafts; take a left onto Sunshine Road across from the Irving station. Every Wednesday at 1 PM, there’s a walking tour of the studios. If you’ve never been out there, it’s well worth the seven mile drive. Not only is it fun to see what people are creating in the studios, but also to walk down the 100 or so steps to the flagpole at water’s edge and admire the view. Haystack also offers evening slide presentations by faculty and staff, as well as end-of-session auctions every second Thursday (check local papers for listings). Your first stop is Nervous Nellie’s Jams and Jellies on your left. This funky little place is a must-stop for anyone visiting Deer Isle. Peter Beerits’ whimsical sculptures, made from salvaged wood and found objects, are scattered everywhere. Just a little further on, Christine York Studio, on your right, features Christine’s abstract watercolors, plus jewelry, textiles, and sculpture. Less than 2 miles more and you will see a sign for Conary Cove Glass Works on your left – where Joleen Dodge creates and shows her beautiful lampworked beads and jewelry. Where can I picnic or take a walk? For a relaxing picnic away from lots of people, there’s Mariner’s Park, located on the right side of Sunshine Road just after the turn from Route 15. The park is maintained by the Evergreen Garden Club, and provides only the basics – there is no restroom or running water, just open, rolling fields, a simple boat launch, and picnic area. Please respect this little haven – it’s maintained completely by volunteers. Shore Acres Preserve on Greenlaw District Road, off Sunshine Road, offers a 1.5 mile trail loop through woods and along the shore. This beautiful little preserve is maintained by the Island Heritage Trust. There’s also a nice hiking trail to Barred Island, located on Goose Cove Road off Rte. 15A. Maybe you’d like to rent canoes, kayaks or bikes. All are available at several locations on the island, Granite Island Guides, and Old Quarry Ocean Adventures. The islands and waters here are some of the most beautiful in the state for sea kayaking. 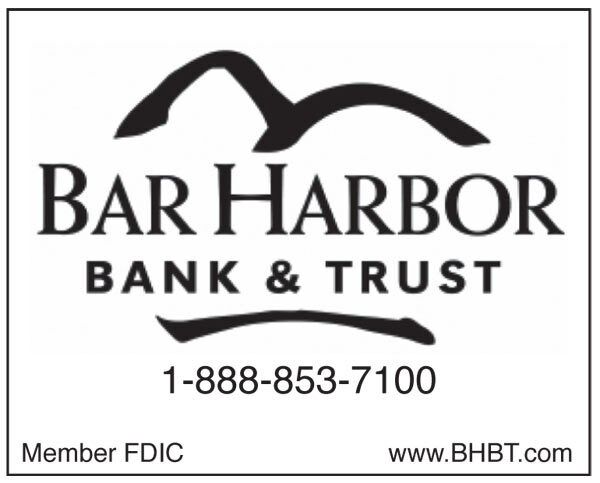 There aren’t many places to sit down and eat lunch in Deer Isle, but one of the busiest local spots is Harbor Ice Cream, right on Main Street in the village.… and, of course, you can always get a cold ice cream! Latté, cappucino, and espresso addicts can stop into Sophie’s Cup on Main Street for a jolt of caffeine and some delicious pastries. This is a great spot to meet friends – both new and old. Out of town, on the way off-island, Madelyn’s Drive In is located on Rte. 15 about two miles north of the village. With a full array of takeout from hot dogs and hamburgers, to ice cream, this is another good place for a bit o’ lunch. They have a lovely area with picnic tables or you can take away. 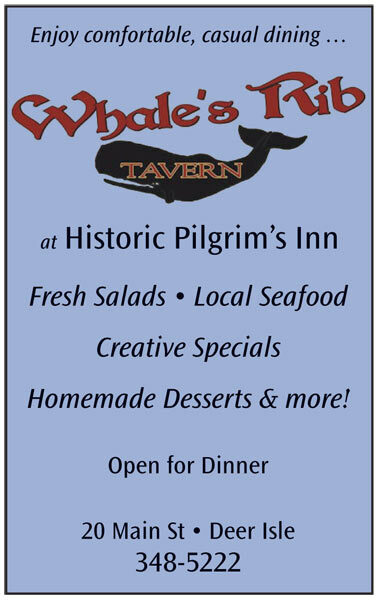 Plan to have dinner at the Whale’s Rib Pub at Pilgrim’s Inn, offering a range of delicious food from casual to more upscale daily specials. If there’s an empty stool, the bar is always a fun place to have a drink and dinner – and meet some new folks to boot! Heading south on Route 15, watch for Maggie’s Clamdigger on your left. Maggie’s will continue to offer their self-proclaimed “best Prime Rib anywhere,” along with an array of good food and drink. We couldn’t confirm at press time whether they would be open for lunch so check their hours to make sure. When all is said and done, vacationing is hard work. If you need a little T.L.C., you can get a massage from “Auntie” Charlo Davis at her studio off Route 15 (by appointment only). Whether you like to shop, gallery hop, dine, hike, swim, kayak, or sail – there’s plenty to do here. If this is your first visit, we hope you enjoy it, and plan to come back another year.